Have you ever wanted a more advanced WooCommerce customer profile page? Somewhere where you would have all the important information about a customer in a single well-organized place. In the following tutorial, I’m going to show you how to create your own advanced customer profiles for your WooCommerce shop that you can use to store custom customer information that can be always available for you and your team. All the information available in a single page. Create and share customer notes. Add customer information that is relevant to your store. First, before we start creating our custom WooCommerce customer pages, we need to make sure that we have the Users Insights plugin installed and the WooCommerce module for User Insights activated. You can activate the module from the modules section of the plugin. For this tutorial, we are also going to use the Custom User Fields and the Customer/User Notes features. Both of these features come with the Users Insights plugin by default. Please note that since Users Insights is a WordPress user management plugin, this feature would work only with WooCommerce customers that are registered users on your installation. Depending on the Users Insights modules that you have active on your website you might see another type of customer information like Customer Device info or user membership information. There is also the User Activity List section. This is where you can see a grouped lists of some of the content creation activity the customer has made like posts, pages, comments and custom post types. But more importantly, with the WooCommerce module activated, there will be an “Orders” section added to the user activity, where you can see a list of the recent WooCommerce customer order history of each user. Each order has a link to its corresponding WooCommerce order page where you can view and edit the order details. The list also includes a link to the WooCommerce order list page, showing the full list of orders for the selected user only. Another section that you might notice is the user/customer notes section. This can be a very handy feature as it allows you to add short text notes about the customer. 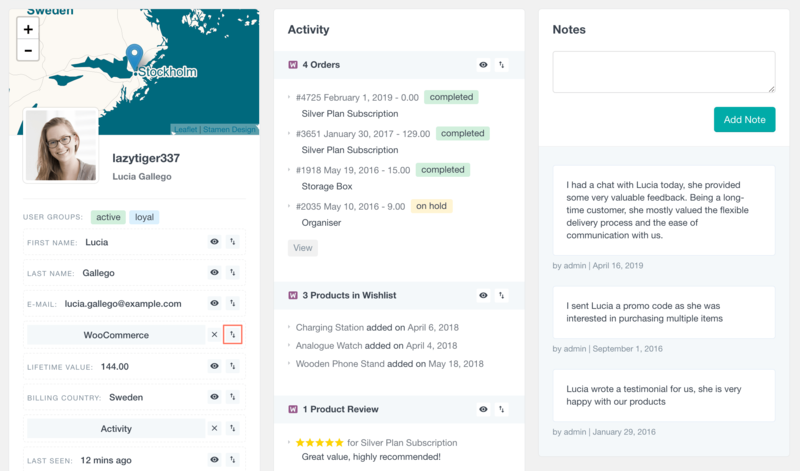 If you want to learn more about the customer note feature please make sure to check the How to create WooCommerce customer notes article. But what if you have some custom customer information that you want to add to your WooCommerce customer profile? This is where the custom user fields functionality of Users Insights comes in handy. The custom user fields section of User Insights plugin allows you to add custom information to your customer profile. This can be a phone number, some kind of status, some important date, organization, nickname, gender, etc. You can add a new WooCommerce customer custom field from the Custom User Fields section of the Users Insights plugin. Here you will see a list off all custom fields that you have created (if any), as well as the form to add a new custom field. For our example, let’s just say that I want to add a phone number field for my customer. 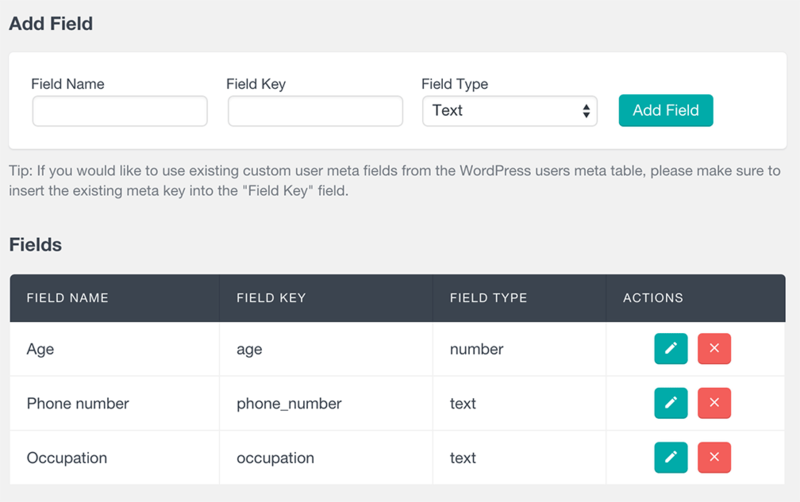 All I need to do is to is set the Field Name option to “Phone number”, choose a meta key name (in our case, this will be user-meta-phone) and select the type that we want the field to be. Currently, the following field types are supported: text, number, dropdown and date(read only). We will select the text type and click add. And that’s it, now we have a new customer custom field that is available for us in the WooCommerce account page of Users Insights of every customer. 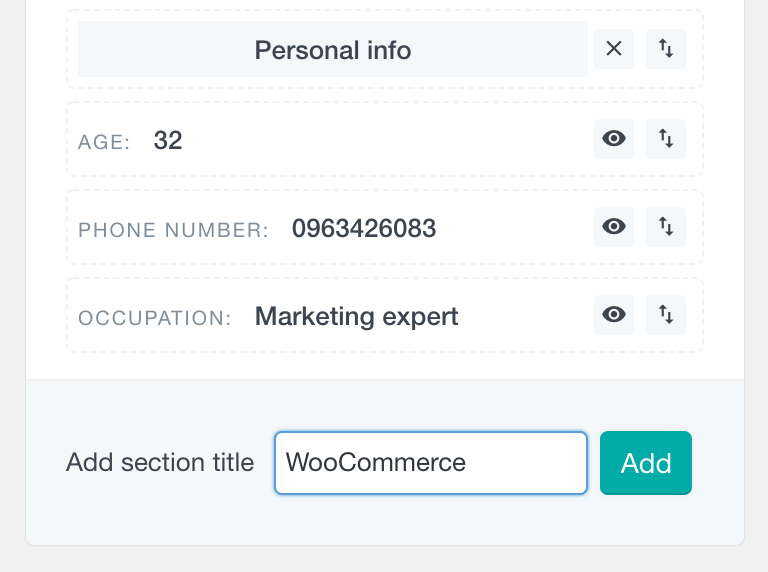 Now that we have the new WooCommerce customer custom field created we can easily add some information that we want to be available in our customer profile sections. To do this, all we need to do is click on the edit icon on the right side of the newly created field. This will turn the text into a text placeholder where we can add or edit the existing information. Some of your WooCommerce checkout fields are stored as custom user meta fields. This is useful for us because this means that we can easily load this data into Users Insights. The process is the same we’d do with other custom fields, but this time we need to use the WooCommerce keys. 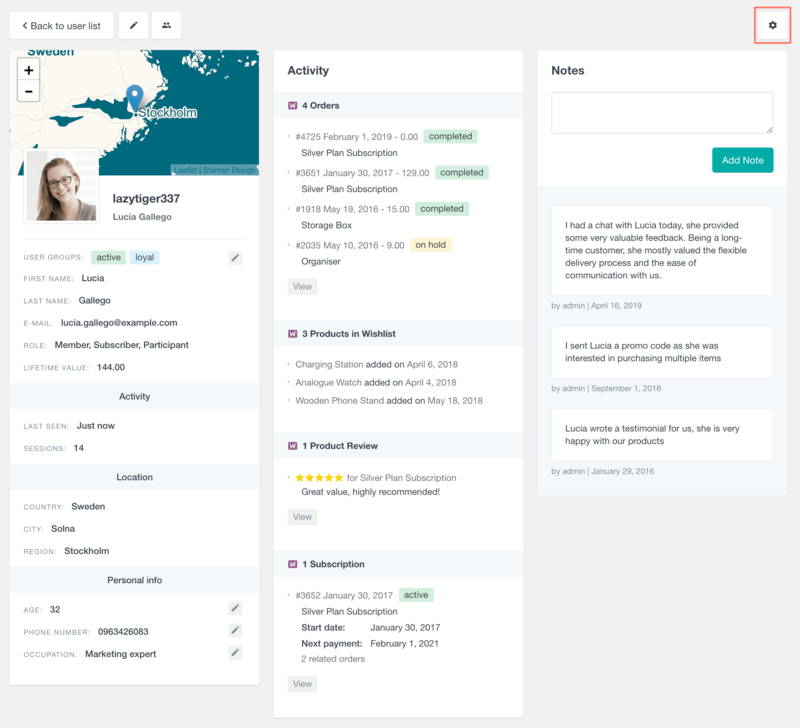 Once you have these fields mapped you can see them in the customer profile page, use them in your filters, your columns and in your export files. It is important to note that all this custom information is also available on the Users Insights user table, as well as in the Users Insights smart filters which means that you can search and filter your WooCommerce customers by this information. You can make the custom fields visible on the user table by clicking on the eye icon and selecting the names of the fields that you want to show. Once you make them visible, you can easily preview the custom fields data of your WooCommerce customers on the user table. You can also sort the table by any of these fields. 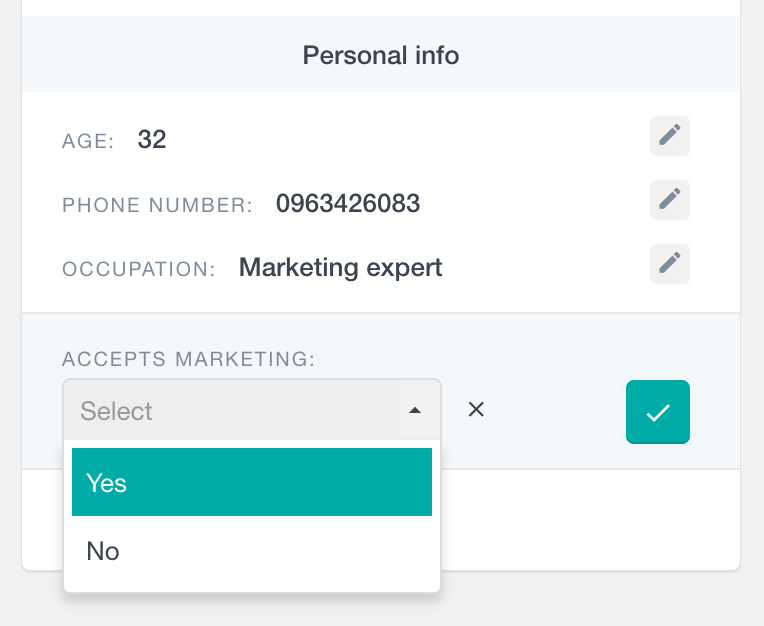 All the custom WooCommerce customer fields are also available in the Users Insights filters, meaning that you can filter your customer list by any of those fields. For example, you might want to find the list of customers that are older than a specific age, and/or the ones whose occupation is related with management. You can do all of this with the help of the Users Insights filters. Let’s say you’ve run a campaign for developers, and you want to check out how many devs have used a certain coupon code. You can do that by filtering “has used coupon” and the users’ occupation. You can even further segment the user list by the ordered products. Likewise, you can check out how many customers used that coupon but aren’t developers. Additionally, it’s possible to use the customer lifetime value to find your inactive but valuable customers. Therefore, if a high-ticket customer hasn’t visited your store for a long time, maybe it’d be nice to reach out to them. This information can be extracted from your WooCommerce user profiles in combination with the last seen filter. In addition to this, you can easily export your filtered customer list including all the custom fields data in a CSV format. In this way you can use this data for your reports or perhaps create an email campaign where you can import a custom selection of customers, along with the custom fields data that you need. With Users Insights, you can quickly filter your WooCommerce clients. In addition, you get to edit your user’s custom fields and customize how information is organized in your user profile. Once the settings edit is activated you get a whole new set of options. For instance, you can add groups for your custom fields. This helps you greatly when it comes to the custom fields organization. In particular, if you have a lot of fields coming from different plugins. After WooCommerce customer fields group is added, you can move it around using the arrows button, which acts as a drag and drop handle. This is a quick way to move it until it is where you want it to be. Then, another great addition is moving around your custom user fields as well. The same way you can move your groups, you can move fields to find an order that works for you. Although it is helpful to have a lot of custom fields, sometimes we just want the main information. That’s when a great WooCommerce customer details page can shine. With profile settings, you can hide some of the custom fields, thus you can achieve your desired organization. That’s it! You have successfully created your own custom profile page for your WooCommerce customers. 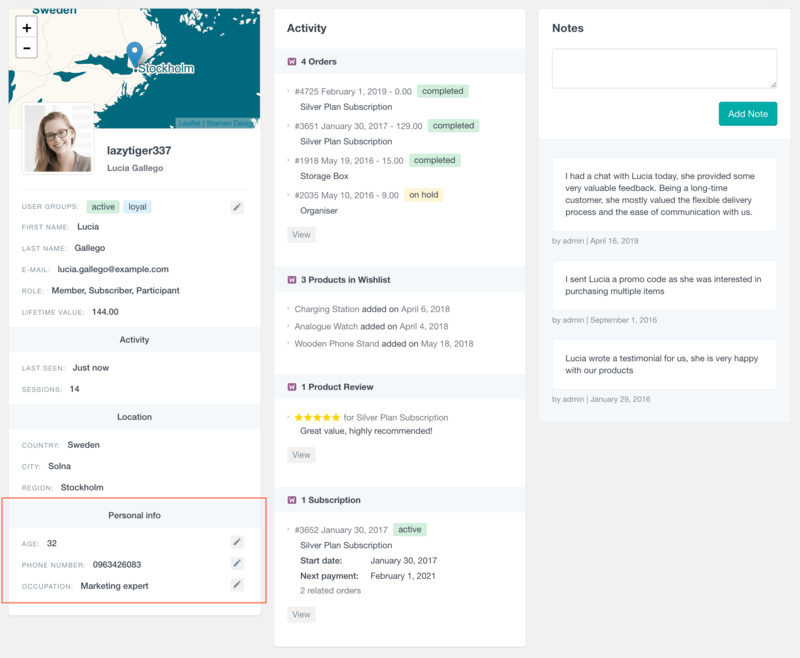 As you can see with our custom WooCommerce profiles, not only that you have the ability to capture and manage far more data about your customers, but all this information can be also easily searchable and accessible via the Users Insights filters. We hope this article helped you improve your customer management and organization.